If you follow the winding path from Santa’s castle down past the stables where the reindeer live, then walk toward a little grove of pine and fir trees, you’ll find a tiny potting shed with an attached greenhouse nestled amongst the trees. Inside it's warm and bright and full of activity because this is where the Christmas Cottontail lives and works! He and his helpers are quite busy these days preparing for his Christmas Eve responsibilities. Some of his helpers are as busy as bees, because they actually are bees, helping to gather up seeds of all kinds of flowers for the Christmas Cottontail to sow in the gardens of the good gardeners. The bees have to watch out as they work, lest they be run over by little critters scurrying frantically back and forth like chipmunks, because they actually are chipmunks, helping organize all the flower bulbs for the Christmas Cottontail to plant. In the midst of all this buzzing and scurrying about, the Christmas Cottontail is sitting at his potting bench, reviewing his list of good gardeners and bad gardeners. Once he has that list sorted out, he has to cross-reference it to a list of different gardening zones so that when the time comes he knows exactly which seeds to sow and which bulbs to plant in each good gardener’s garden. He is also deciding which gardeners have been especially good and putting those names on a list for the under-bunnies to take up to the main house to add to Santa’s list. Then Santa and his gardening elves will decide which gardening books and tools those gardeners should receive. And it all has to be done in just two weeks! A distant relative of the sweet little Easter Bunny, the Thankful Thumper, Bountiful Bunny, and the devious Halloween Hare, the Christmas Cottontail was discovered by Santa Claus on one of the earliest Christmas Eve’s. He was just a tiny little bunny back then, nearly starving, trying to get to some of the carrots that someone had left out for Santa's reindeer. Taking pity on the poor bunny, Santa took him back to the North Pole and named him the Christmas Cottontail. Of course everyone knows that no one at the North Pole gets to just sit around eating carrots all day long, so over the next spring, summer, and fall, Santa and his gardening elves trained the bunny how to properly scatter seeds and plant bulbs in the flick of a whisker. Now every year, the Christmas Cottontail checks his list of good gardeners and bad gardeners, packs his seeds and bulbs, and flies off with Santa Claus and his reindeer. At the good gardeners’ houses, he scatters the seeds and plants the bulbs to bloom at Easter time. At the bad gardeners' houses, he stays in the sleigh and waits for Santa. At every house he looks for carrots left for the reindeer and sneaks a bite or two for himself and then gives the rest to the reindeer. 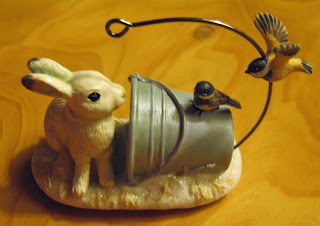 Gardeners then have to wait until spring to find out if the Christmas Cottontail visited their garden on Christmas Eve. If there are blooms in early spring it means the gardener was good and the Christmas Cottontail worked his magic. If there are no blooms in the springtime, it means the Christmas Cottontail decided the gardener was bad and stayed in the sleigh. By the end of the storytelling, the bees are nodding off and the chipmunks and under-bunnies can barely keep their eyes open. They’ve all heard this story many times, but they love to hear it again and again and when it's over, they are refreshed and ready to get back to work. And as they work they discuss how they’ve never been busier. Apparently many people are taking up gardening these days! Many have been good, and some have been so good that Santa will need some extra Hoe, Hoe, Hoe, to deliver all those gardening books and tools to everyone in one night! Oh Carol, I think the Christmas Cottontail story is my favorite of all your tales. Thanks. I love this story Carol. What a delightful tail. ;) Since you have such a strong connection to the Christmas Cottontail please tell him I have been a very good gardener girl. The Christmas Cottontail is the one bunny that is allowed to visit Squirrelhaven. But please warn him that we have a resident fox, so he needs to be very quiet. A delightful tale, Carol! I wish I had read this before Wednesday--I think I may have spied the Christmas Cottontail sitting outside my front window that day. I thought he was just trying to find someplace warm. I hope he didn't think I was a heartless person. If I'd only known who he was, I would have thrown him a few carrots. What a delightful story! I may have seen the Christmas bunny reconnoitering alongside my raised veggie bed a couple nights ago. He was eying the carrots that are still in there. You tell the best stories - and know so much about the histories of holidays. You must be a fabulous researcher. I hope your readers will visit me - even though I have no stories - but I do have a Giveaway! Right Rose Right Place by Peter Schneider and 2 dozen CowPots. Oh, I hope I get a visit from the Christmas Cottontail! I'll make sure to keep the Garden Terrierist inside on Christmas Eve. I'll leave carrots on a special plate near the garden shed! I realized I read the story, chortled in glee, commented to you on twitter--and forgot to comment here! But it was worth reading again (and chortling over again). Your sense of humour just hits me right on every time, Carol. Oh Carol what a wonderful Christmas story..worthy of a book...I hope I was a good gardener this year! Merry Christmas Carol!